Dynamic templates have a "menu bar" 1/5 of the way down the page - which provides a combination of the Pages gadget, and limited navbar functions. At the far right end of the menu bar, you'll see 2 tiny icons - when you are properly logged in as the blog owner. New post, the "pencil" icon. Blog administrators have limited navbar functions, on a blog that's published using a dynamic template. Blog administrators have limited dashboard access using menu bar icons. The menu bar, just below the dynamic template title section, has the "New post" and "Home" links. There's the menu bar, just below the Title / Description. At the far end of the menu bar, the "pencil" and "home" icons. 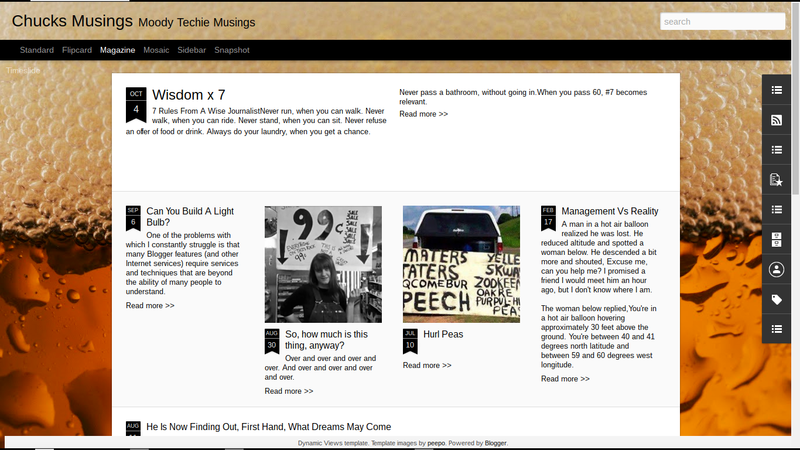 You'll see the "pencil" and "home" icons - when you are logged in to Blogger, as the blog owner. Blog readers have no navbar icons, in the dynamic template menu bar. If you're not logged in to Blogger, you get no menu bar dashboard access. If you never logged in to Blogger, or if you have a problem with a filter blocking access to the login cookie, you won't have any dashboard access. If you can't access the dashboard using icons, you'll be able to login - just use a bookmarked link. If you have a cookie filter problem, you may have to login again, to access the dashboard for your dynamic template blog. A #Blogger blog that uses a dynamic template won't have a navbar, with easy access to the dashboard, and a convenient login / logout link. Dynamic templates provide a menu bar, which is a combination of a miniature Pages gadget and navbar.